When you want to eat cheaply or quickly while you are out, beef bowl is the best. I recommend it to Filipinos because it is rice dish. Beef bowl is ‘Gyudon (牛丼)’ in Japanese. Red one is Beni Syouga (紅生姜). It is what pickled ginger in plum vinegar. You can topping it yourself. 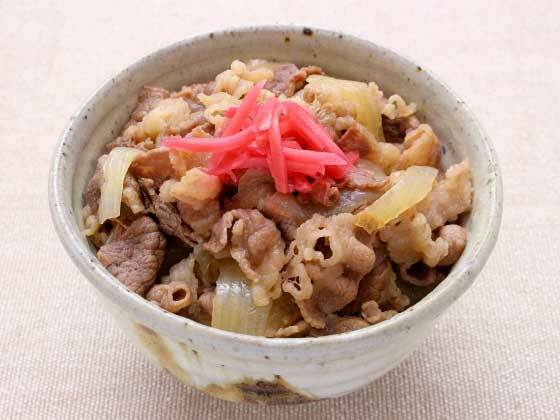 Beef bowl is easy to cook, just put on simmered onion and beef on rice. So, it will be served as soon as you place an order. And a simple dish is about 400 yen. Even if you additional order a salad with consideration for health, it fits at 500 yen. Yoshinoya, Matsuya, Sukiya, Nakau are famous as beef bowl chain store. There are shops in the city center and major railway station.